Delightful, pink 5-7" flowers really stand out against the healthy green foliage. Full, double flowers bloom on old wood, and single flowers bloom on new growth. 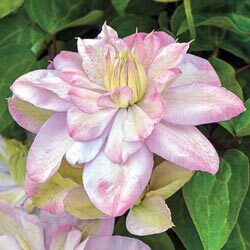 The pointy, pale pink sepals have darker margins and the anthers are yellow on white filaments. 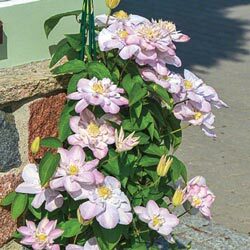 Striking , versatile and manageable, the clematis plant is a favorite vine among gardeners. Easily trained to scale mailboxes, fence posts, garden arbors and more, the combination of height, color and beauty creates a dynamic garden display wherever it is placed. 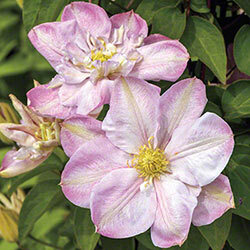 Innocent Blush Clematis can be grown in full sun or partial shade. 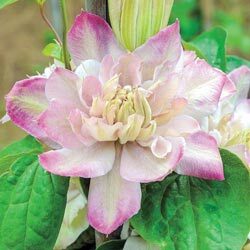 Blooms in early summer and will rebloom in late summer. Deer tend to avoid.